Motorcycles are intricate machines with many working parts and mechanical components that must be in perfect sync. The design, manufacture, and construction of a motorcycle require meticulous craftsmanship, time, experience, analysis, and careful review. Every time a motorcyclist hits the road, an intrinsic trust is placed in the design and manufacture of the bike. Consumers expect, and ultimately deserve, comprehensive testing of the manufacturing process, guaranteed quality control of each part, and intensive design drafting to ensure the product is safe for its intended use. Mechanical flaws or design defects, even seemingly small, can lead to disastrous consequences on the road, including serious injuries or wrongful death. 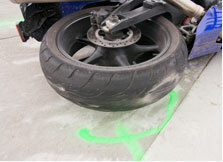 The Boston motorcycle accident lawyers at Bellotti Law Group, P.C. have successfully represented motorcyclists who have sustained broken bones, paralysis, spinal cord injuries, traumatic brain injuries, burns, lacerations, and many other serious injuries. We have also helped victim's family members when a motorcyclist suffered fatal injuries because of another person's negligence and carelessness. Contact our Boston, Cambridge, or Quincy office today at 617-225-2100 for a free consultation. There are many components of a motorcycle, including the engine, fuel lines, handlebars, headlights, wheels, etc. that can cause malfunctioning or instability if not designed or manufactured correctly, causing the motorcycle to crash into another vehicle or object or throwing the rider from the seat. The negligent manufacturers of a defective part may attempt to apprise consumers of the flaw via a product recall, but that may not effectively reach affected parties before they hit the road with a defective, high-risk motorcycle. Much like accidents caused by negligent drivers, liability for injuries caused by manufacturing defects or defective product design falls on the at-fault, negligent party. The Boston motorcycle accident attorneys at Bellotti Law Group, P.C. will hold any negligent party accountable for your medical bills, rehabilitation costs, lost wages, pain and suffering, and other damages. This includes investigating a claim against the motorcycle manufacturer who placed a poorly designed product or defectively manufactured parts into the stream of commerce and on the road. Our attorneys understand the immense worry, anger, and financial strain that frequently accompany motorcycle accidents. These feelings are often amplified when victims and their families learn that the serious injuries or wrongful death could have been avoided by manufacturers simply doing their job and practicing more careful inspection, design, and testing of their products. Don't let negligent parties get away with the tremendous pain they have caused you and your family. Instead, allow us to help you obtain rightful compensation for your medicals, lost wages, pain and suffering, loss of daily enjoyment, property damage, and other expenses, so you can focus on a complete recovery. All consultations with our Boston motorcycle lawyers at Bellotti Law Group, P.C. are strictly confidential and without charge. Contact us today at 617-225-2100 right away. The Statute of Limitations is ticking on your claim and a delay may prevent you from being able to recoup what is rightfully yours.